Australia, Malaysia and China announced the search area in the southern Indian Ocean, which represents the highest priority for future search efforts for missing Malaysia Airlines flight MH370. An expert satellite working group has reviewed all existing information in order to define a priority search zone along the arc in the southern Indian Ocean. The priority area of approximately 60,000 km2 extends along the arc for 650 km in a northeast direction from Broken Ridge. The width of the priority search area is 93 km. This area was the subject of the surface search from Day 21-26. 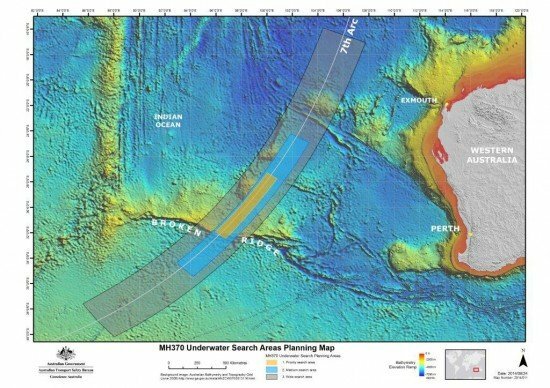 The search for MH370 continues with a mapping of the ocean floor in the search area, to be followed by a comprehensive search of the sea floor. This bathymetric survey has already commenced, with the Chinese survey ship Zhu Kezhen and the Australian-contracted vessel Fugro Equator conducting operations in the priority areas. It will take around three months to complete the bathymetric survey.